Indonesian President Joko Widodo (left) and his running mate, Ma'ruf Amin, wave to journalists after a news conference in Jakarta, Indonesia, on Wednesday. "From the indications of the exit poll and also the quick counts, we can see it all, but we must be patient to wait for the official counting from the Election Commission," the president told supporters after voting wrapped up, according to The Associated Press. He called for unity. Official results are expected in May. Subianto has not yet conceded, the wire service adds. His campaign alleges some irregularities — but, as the AP notes, "analysts say the claims are absurd and designed to undermine the election." During his campaign, the wire service says, he "ran a fear-based campaign, highlighting what he sees as Indonesia's weakness and the risk of exploitation by foreign powers or disintegration." 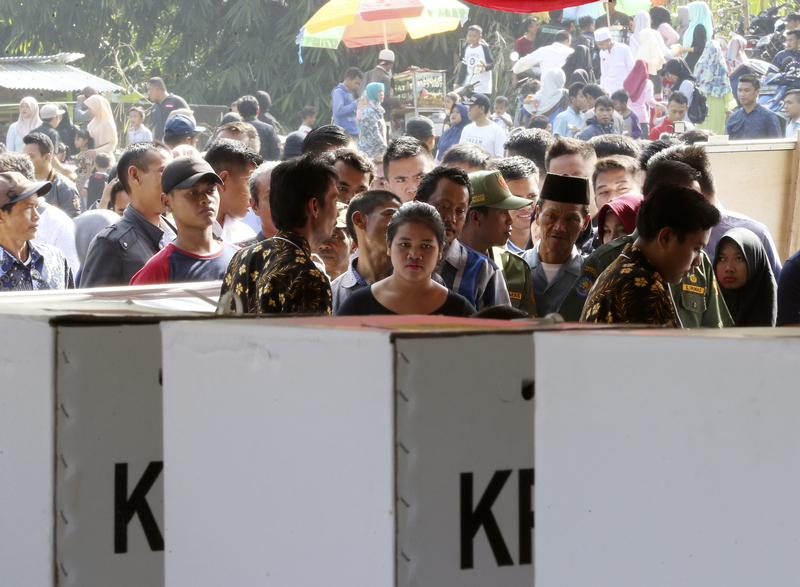 People queue up to vote at a polling station in Bogor, Indonesia, on Wednesday. Indonesia's rising religious conservatism played a major role in this race. 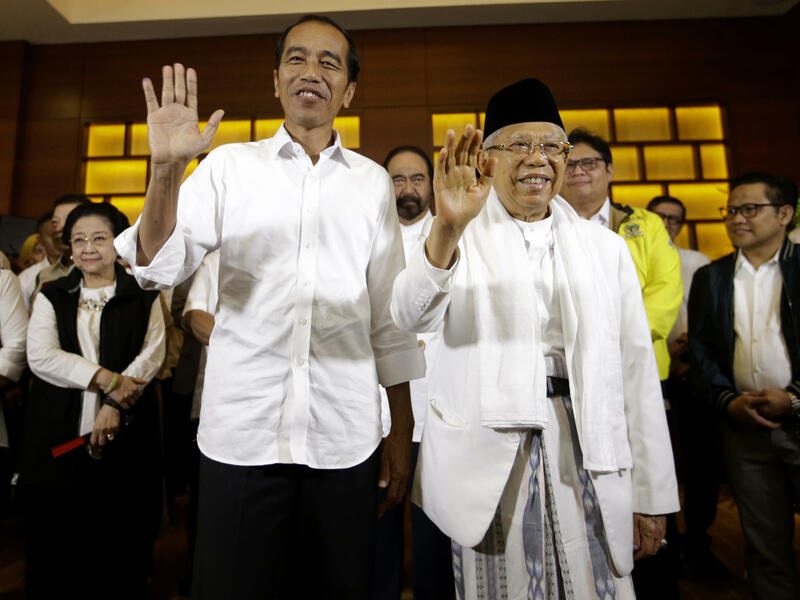 Widodo named a religious cleric with some hard-line views as his running mate. "That's a move that really jolted some of his supporters," NPR's Julie McCarthy reported from Jakarta. "Widodo moved to the right in a bid to neutralize the allegation that came up against him that he's not Islamic enough." Human Rights Watch has said that the cleric, Ma'ruf Amin, "has been central to some of the most intolerant elements of Indonesian contemporary religious and political culture, so fear of the negative impact he could have on the rights and safety of religious and gender minorities is well founded." McCarthy says the president, commonly known by his nickname Jokowi, will face a challenge in the coming term: "He faces the daunting task of balancing an increasing Islamization with his more secular goals of building roads and strengthening his country's young workforce." The power of the country's clerics has been visible during the campaign – for example, at a rock concert campaign event, the heavy-metal-loving incumbent made sure to thank clerics for supporting him, as McCarthy reported. In the past few years, "Indonesia has seen conservative religious groups grow increasingly vocal," the BBC reported. For example, after pressure from hard-liners and street protests, a former governor of Jakarta who is Christian was jailed for blasphemy against Islam. The BBC has reported that the two candidates' policy platforms were not especially different. "Therefore, the only contrast they can draw is by showing their religious credentials," Made Supriatma, an Indonesia expert at the ISEAS-Yusof Ishak Institute in Singapore, told the broadcaster. The vote itself was a massive logistical undertaking for a country made up of some 17,000 islands spread across three time zones. About 193 million people could vote in some 800,000 polling stations, the AP reported. Parliamentary and regional elections also took place on Wednesday.